Did you know that, according to the US Department of Agriculture, it costs a family of four $243.70 per week on the average for groceries? This can be less if you have a smart spending plan for your food shopping as this drops the average to $248.50 for families that have kids between the ages of six and 11. Do you have a family of five? Then believe it or not it is possible to feed them for $125 a week and here are eight tips that will help you get there. 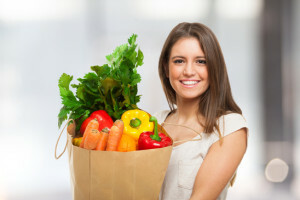 One easy way to cut the cost of your groceries is to get on your store’s loyalty program. As an example of this, where we shop the store offers discounts to customers that have its loyalty cards. These cards are very easy to use, too. Just swipe yours at the checkout counter and you’ll automatically get the discounts applied. In addition, if you link your card to the store’s website it’s likely that you’ll start getting emails with special offers on certain items as well as information about its sale items for the week. This may take some time but you can figure out which of the stores in your area has the lowest prices on your groceries. To do this, you will need to load your grocery cart with the same items from each of the three stores where you shop the most. Then compare their costs. For example, one woman did this and found she paid about 20% less when she bought her groceries at Walmart. Of course, this may be different depending on where you live. You also need to check your stores’ weekly online circulars to learn which one has the deepest discounts on the items you need. The major grocery chains have free apps for your Android or iPhone. You need to get the ones for the stores where you shop the most. These apps can be very helpful especially for those times when you neglected to go online and check for sales before going to the store. As an example of this, the app from Kroger will show you what’s on sale based on the items you buy most regularly. It also has coupons you can scroll through and then add the ones you need to your loyalty card to get discounts when you check out. You can save a good deal of money simply by not buying brand-name items but by buying store brands instead. These products are typically as good as brand-name items but significantly cheaper. Where we shop store-brand canned vegetables are generally $.40 to $.50 less then their brand name equivalents. A 1/2 gallon of store-brand milk typically costs a dollar less than a brand name milk such as Horizon. And if you buy store-brand frozen fruit you’ll probably save a couple of dollars. Instead of creating a menu and then looking for sale items, try building your menu around them. As an example of this, you might love strawberries but you should buy them only when they’re in season. Ditto all other vegetables and fruits. Is your favorite store selling ground chuck at $4.99 a pound this week? Then this would be a good week for meatloaf. If you do the opposite and build your weekly menu around what you would like to eat, instead of what’s on sale, you could easily end up spending twice as much. Sliced fruits and vegetables and those pre-made side dishes you see at the deli can look very tempting because they make meal prep so much easier. But you’ll pay for this. A head of lettuce where we shop costs less than a dollar and we can get some mushrooms and a bunch of radishes for maybe $.80. In comparison, the price of a veggie salad mix on sale is typically $2.50. Beef is the priciest meat. For example, at our store a sirloin steak costs $8.68 per pound versus$1.48 per pound for a whole chicken or almost eight times as much. When you do buy beef, try to stick to the cheaper forms such as ground chuck or steaks that are on sale. But most weeks, it’s better to buy chicken or use other sources for your protein such as beans. There are times when buying your groceries in bulk will get you even deeper discounts. Our store often has a better markdown when you buy five or 10 of the same item. We’ve seen cereal at $2.50 with an additional buck off each box if you buy three. This brings the discount to $1.50 per box or a total savings of $4.50 on all three. Look for these bulk discounts on items you would normally buy and then stockpile them for future use. You might love the idea of feeding your kids only organic foods but they cost much more than their conventional counterparts. In fact, a Consumer Report study in 2015 discovered that organic foods, on the average, cost 47% more than conventional foods. Given this, you need to be selective about which ones you buy. You might choose to buy organic milk because you don’t want your children drinking milk from cows that were subjected to antibiotics and hormones. You might also decide to buy organic chicken, organic eggs and organic vegetables – but only when they’re on sale. And you might choose to buy organic versus foods that are high in pesticides. The Environmental Working Group has a list of what it calls the Dirty Dozen fruits and vegetables. Apples and strawberries are currently on the top of this list so this is a case where you might want to spend the extra money for organic. Following is a video that explains which organic fruits and vegetables are healthier for you and, thus, worth their extra cost.